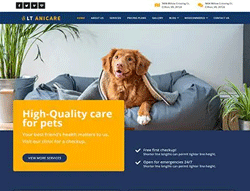 LT Anicare is responsive Animal Care WordPress theme designed especially for animal care website. Pet WordPress Theme builds on strong framework with Genesis framework. It supports mobile / tablet version with 100% responsive layout. Besides, it also comes with 4 color styles helping to create wonderful wordpress websites. Each template has been made unique in its design, but all of them provide aesthetic appeal, easy-to-browse structure and user-friendliness. Pet WordPress Theme uses for animal care center to showcase the prevention, diagnosis and treatment of disease, disorder and injury in non-human animals. And animal care services with greatly wonderful images of healthy, cute pets and light-colored design. Informative content blocks are complemented with harmonious color blends and high-quality imagery in effective sliders, headers, and footers. Why not get templates that are designed for those cute little critters? Pet WordPress Theme will surely catch your audience’s attention.